Mr. Drewyer has been exhibiting his paintings since the early 1970s. His drawings, watercolors, and oils can be found in public and private collections throughout the mid-Atlantic region. Over the years in the Leesburg area he has exhibited his work at the Rose Gallery, Gallery 222, ArtSquare, and was a founding member of The Washington Collection of the Fine Arts. 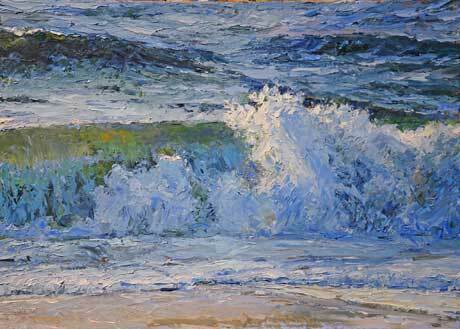 Mr. Drewyer received his Master of Fine Arts degree in Painting from The George Washington University in 1986. While studying at GW he was awarded the David Lloyd Kreeger Purchase Award for painting as well as a Graduate Fellowship. Mr. Drewyer has recently retired after 32 years with Loudoun County Public Schools. In 1992 he was awarded the Washington Post’s Agnes Meyer Outstanding Educator for Loudoun County. Mr. Drewyer taught advanced studio classes at Loudoun Valley High school for the last twenty two years, including 20 years as the Chair of the Fine Arts Department. In 1987 he served as Loudoun County Public School’s first county–wide Art Supervisor. In the 1980s, Mr. Drewyer was integral in starting the summer arts program for students that has since grown into the area’s “Summer in the Arts." In the 1990s, Mr. Drewyer also taught drawing as an adjunct for both George Mason University and the Northern Virginia Community College, Loudoun Campus. For more information, contact the artist at [email protected] or visit his painting blog at www.deantaylordrewyer.blogspot.com.